Gippsland offers a variety of natural attractions like nowhere else in Victoria. Unspoilt beaches, pristine rainforests, snowfields, hiking and riding trails provide backdrops for wineries and food producers, festivals for residents and tourists to indulge in all year long. This eastern-most region of Victoria offers a dramatic variety of landscape and relaxed, welcoming communities that combine to create an undeniable allure. Stretching from outer Melbourne to the eastern-most point of Victoria, Gippsland is the powerhouse of Victoria’s natural resources and commodities economy. It is home to the state’s electricity industry and other key sectors such as agriculture, forestry, dairy, fishing, tourism, engineering, finance, health care and education. Art and cultural festivals abound, and the gourmet food and wine on menus throughout the region make it a sensory feast. In Gippsland you can build and enjoy a life like nowhere else. School upgrade for Kurnai College. Bairnsdale, Churchill, Drouin, Foster, Inverloch, Korumburra, Lakes Entrance, Leongatha, Mallacoota, Moe, Morwell, Omeo, Orbost, Phillip Island, Sale, Traralgon, Warragul and Wonthaggi. Gippsland’s economy is predominantly based around natural resources and commodities, with key industry sectors including agriculture, forestry, dairy and pastoral industries, fishing, and coal mining, oil and gas extraction and processing. The agribusiness sector is a significant employer in the region, with over a third of Gippsland’s business involved in agriculture and fishing, while the aged and health care industries have seen strong growth in recent years. The Gippsland region is home to Australia’s newest university, Federation University, which brings together the University of Ballarat and the Monash University Gippsland Campus to provide access to higher education, TAFE, secondary schooling and research opportunities. A number of TAFEs with campuses across the region are complimented by newly established Technology Enabled Learning Centres which provide more rural students with access to a greater variety of tertiary courses. Water skiing, surfing, snow skiing, tennis, four-wheel driving, football and cricket are just a few of the ways Gippsland residents fill in their weekends. Others prefer to horse ride through Noojee, fly fish on the Thomson River, or hike in Wilsons Promontory National Park instead. Art galleries, museums and restaurants available throughout the year, and Gippsland hosts a variety of major festivals including the Creative Gippsland Arts Festival, Maffra Mardi Gras, and music festivals across the region including in Boolarra, Inverloch, Paynesville. The West Gippsland Arts Centre at Warragul is a 500-seat venue that has showcased the Melbourne Symphony Orchestra and Sydney Dance Company, and Sale is home to the 400-seat ESSO BHP Billiton Entertainment Centre hosting musicals, operas and comedy. Energy sector facing significant challenges resulting from global shift to a low carbon economy. The RDV information portal has more detailed data and statistics on the Gippsland Region and regional Victoria more broadly. 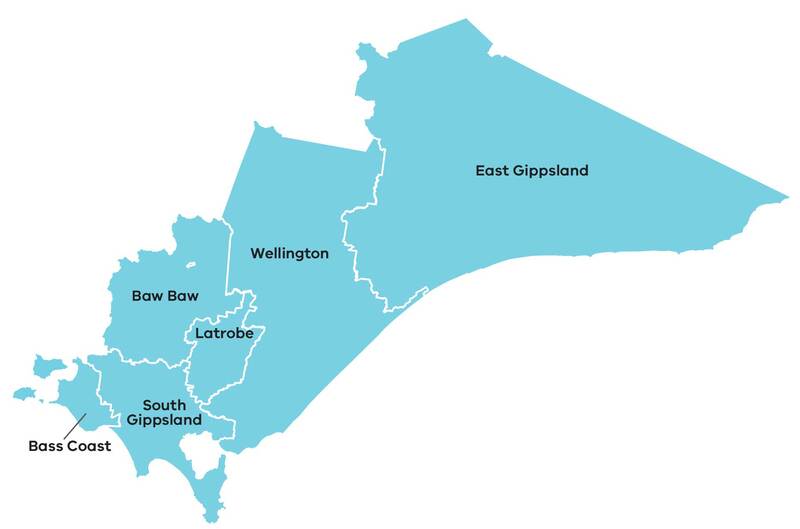 The Gippsland Regional Growth Plan is one of eight regional growth plans being prepared across Victoria. It provides a broad direction for regional land use and development as well as high level planning frameworks and the means to implement the strategic land use and infrastructure directions that are set out in the Regional Strategic Plans.